In 1929, a group of U.S. Army Air Corps fliers, led by then Major Carl Spaatz, set an endurance record of over 150 hours while flying "Question Mark", an Atlantic-Fokker X-2A, over the city of Los Angeles. "Question Mark" stayed aloft for seven days in January of 1929, refueling 42 times in the air. 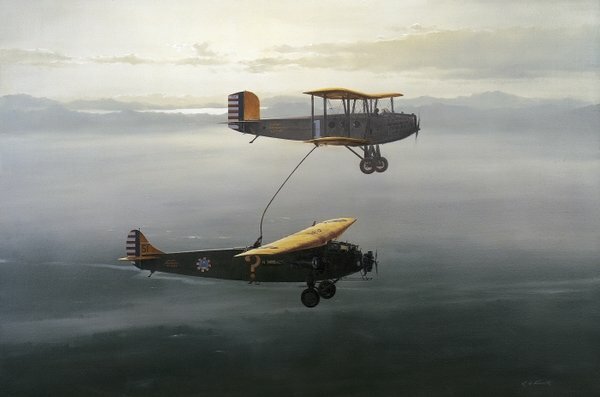 Because radio communication was unreliable at this time, the pilots in the two planes communicated by notes dropped to the ground and by hand signals, flashlight signals, ground panels, and messages written on blackboards carried in the planes.